At PAX East we plunked our con-weary body down in front of a Project Shield handheld synced with a Geforce-equipped PC. We were thankful not only to get some quality time with Nvidia’s upcoming handheld, but also to just sit in a chair. The Elder Scrolls IV: Oblivion was the title being served, and we used the Shield’s dual stick and triggers setup to harass some hapless (but not helpless) guards with a few fireballs. Dual wielding is the standard approach in Oblivion. Players generally equip a weapon or spell in their right hand, and either a defensive item like shield or a second form of retaliation (sword, mace, lightning bolt, healing spell) in the left. This is why having two triggers and sticks is so essential to bringing a real gaming experience to handheld. The controls were tight, and when we looked at the computer monitor with its tricked out Geforce-fueled graphics, it felt like we were getting the best of both worlds: simple console controls and high-end PC graphics. Wirelessly streaming PC titles to your HDTV is one trick Nvidia plans to teach the shield down the road, but initially this will require and HDMI connection. We’re glad that Nvidia has thought of that, because no matter how hard you try, a dinky handheld display will never hold a candle to 1080p screen. It didn’t do the Shield any favors to be played right next to a monitor rendering the exact same image, but looking much better. Sparks and flares coming off our fireball attacks looked dull and blocky. While we were impressed at the one-for-one, zero latency between Shield and the computer it was synced with, it made us wonder why you would use this handheld when you’re in the same building as your computer. Being able to bridge your TV and your PC with the Shield is a good reason. It could be a killer feature, especially if you’re someone who’s bent over backwards to do it with HDMI, using a wireless mouse and keyboard on the couch. We have just such a setup at home. Getting back to 5-inch display strapped to Project Shield, it’s 720p and just 294 ppi. That was nothing to sneeze at a few years ago, but now your average smart phone is rocking ppi in the mid-300’s. The lovely new HTC One has 440 ppi. For phones, a ppi in the high 200’s, low 300’s is mid-range territory. Android games seem like a better fit for this handheld, since they’re played locally, and don’t require an expensive gaming PC and the will to not use it. Still, that makes us wonder what this handheld will cost, and if it will be worth the price. Nvidia hasn’t opened up about price, but The Verge seems to think it won’t be cheap. If that’s the case, we’re not sure the Shield will be able to compete in the Android gaming market. We can’t see why someone would choose it over something more affordable, albeit less feature-filled, such as the Moga Pro, or just a gaming laptop, if its truly mobile PC gaming they crave. As we hacked and slashed our way through the demo, an Nvidia rep told us that the Shield would be fine-tuned a bit before its release. Specifically it’s the D-pad and the triggers that might get some tweaking. While we couldn’t find anything amiss with the triggers, the D-pad did feel cheap and imprecise. There wasn’t much differentiation between a diagonal and a lateral press. As with the Xbox 360 version, Elder Scrolls just uses the pad for scrolling up and down through weapons and spells, and it was good enough for that. We wouldn’t want to use it for a fighting game or a platformer, though. We were really relieved when the rep pointed out the D-pad as something that could be reworked. Controllers and peripherals aren’t really Nvidia’s bag, and the fact that it’s aware of what’s not up to snuff shows that it’s doing homework and easing into this new market smoothly. Q2 2013 is still Nvidia’s official word on Project Shield’s release date. As that date fast approaches, we’re hoping that the graphics card giant has some more tricks up its sleeve for this handheld, or at the very least a competitive price. Hopefully it can launch with the PC-to-TV streaming, or it will follow short after. Otherwise, it may have a tough time finding an audience, and end up inviting some unfavorable OnLive comparisons, or become a handheld that few put their hands on, like the PS Vita. Read our report on next generation gaming in tech. magazine, including the latest on the Xbox 720, Project Shield and the PS4. 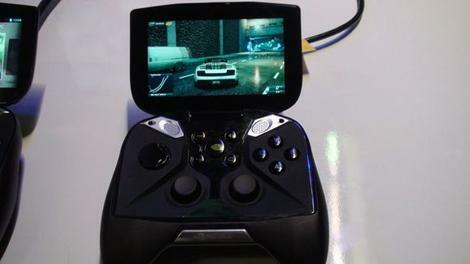 The CES 2013 announcement of the Nvidia Project Shield means that PC games finally have a dedicated handheld system, and the idea isn’t completely ridiculous. Okay, the controller-based design is a little out there at first glance. But flipping open the screen’s protective lid and picking up the gamepad feels natural. It’s akin to holding an Xbox 360 controller. There are four individually colored face buttons in the same upper-right quadrant, and four shoulder buttons on top. In fact, the only difference between the Project Shield controller layout and the Xbox 360 controller is the placement of the analog stick and D-Pad. Nvidia reversed the two. In the end, PS3 gamers will feel right at home with this side-by-side dual analog orientation, while Xbox players will be accustomed to the overall body of Project Shield. Besides the short-lived Hip Interactive Screen Pad Controller from a decade ago, this is the first screen-mounted controller that is getting a big push from a third-party company. Its 5-inch touchscreen is 720p, and even though everyone’s focus is on the gamepad, there is multitouch in the 294 dpi retinal screen too. Having the option to utilize the touchscreen for menus while always being able to take advantage of the controller’s buttons for just about everything else is extremely convenient. The Nvidia also packed a powerful set of speakers into the top of the controller portion of Project Shield. It’s twice the low-frequency output of high-end laptops. One of the best parts of the Nvidia Project Shield is the fact that its launch games are familiar – it’s everything you can already own on the PC, Steam, Google Play, and Nvidia’s own TegraZone store. PC and Steam games can be streamed to the device through WiFi so long as the PC running the games is packing an Nvidia GeForce GTX GPU. As a result, all of the usual suspects were on hand to play, including Call of Duty: Black Ops 2 and Need for Speed: Most Wanted, and they streamed to the device flawlessly without lag. TegraZone games and Google Play apps, meanwhile, can be downloaded directly to Project Shield device. Nvidia, being as open as possible, isn’t gimping this version of the Android OS – it’s running a pure Jelly Bean 4.2. All of this means that Project Shield will have the biggest launch lineup for any handheld gaming system ever built. You can’t beat the countless PC games, more than 18,000 Steam games, and 675,000-plus Google Play games and apps. Battery life is always a bone of contention when it comes to handhelds, but Nvidia thinks that it can pull off an impressive 20-plus hours from the Project Shield when streaming. That’s because all of the processing power is being handled by the GeForce GTX GPU-equipped PC. Project Shield’s hardware, meanwhile, uses energy-saving PRISM 2 technology and a battery-saver core to lengthen that charge time. Essentially, Nvidia is doing what Netflix and OnLive have done for users – having all of the major resources handled in another location and using WiFi bandwidth to offload the heavy-duty processing. Of course, the PC and Steam games need to be running on the computer to stream to a Project Shield. This means that the device’s handheld capabilities are pretty much limited to the home. With the exception of taking a gaming laptop with you to a location that has WiFi, this kind of negates most of the handheld gaming aspects outside of Google Play and TegraZone titles. Nvidia did make it possible to boot up a game via the handheld thankfully. You won’t have to run to the computer each time you want to load a new game. 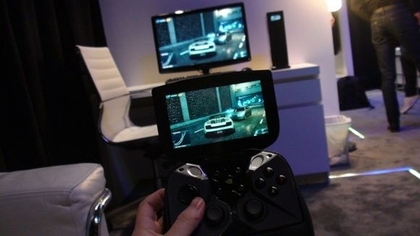 Under Project Shield’s gamepad exterior lies an Nvidia Tegra 4 processor, which has a 72-core GeForce GPU. This is also the first quad-core application of ARM’s most advanced CPU core, the Cortex A-15. All of this translated beautiful graphics that maintained snappy movements and lag-free gameplay during tests. Beyond the Tegra 4 processor, Nvidia wasn’t ready to talk about the disk capacity that the device will have in the future. In fact, the company wasn’t even willing to divulge the storage being employed by the current prototype. On disk capacity, all that Nvidia has confirmed is that there will be a MicroSD card slot for expandable storage. Other ports include a micro USB port, a headphone jack and an HDMI port for easy video output to a big screen. Nvidia, working closely with Valve, ensured that Project Shield would take advantage of Steam’s Big Picture Mode. For just announcing it at CES 2013, Nvidia sure has an ambitious Project Shield release window. The company plans to launch the device in Q2 2013. This is possible because the the powerful, but efficient Tegra 4 processor is ready to go and all of the launch games are spoken for through services like Steam, Google Play, and TegraZone. One thing that Nvidia still needs to decide on, and quickly, is the Project Shield price. So far, the company has remained tight-lipped on how much it will cost in that April through June release date window. Even without a set price, Nvidia is already setting its sights high for Project Shield. In addition to trying to sway gamers who have become bored with the Nintendo 3DS and PlayStation Vita, it’s going after the broader smartphone and tablet gaming market, too. Nvidia said that it created Project Shield to do for games what the iPod and Kindle have done for music and books. As long as it’s priced right, Project Shield may just have the hardware to back up that statement. Nvidia Project Shield is supposed to launch in Q2 2013, and it’ll be able to play PC, Steam, Android and TegraZone games out of the box. That’s quite a launch lineup. Unfortunately, PC and Steam games can only be streamed via local WiFi, as there needs to be a PC running the games; this controller-based handheld is just a receiver for these more powerful titles. The technology is interesting and the idea is out of left field, but the price and the inability to stream all games may limit the appeal of Nvidia’s PC portable.